To some the Canadian Museum of Civilization (CMC) might be an odd place to experience the power of the latest mobile technology. But a new initiative at the museum in Gatineau, Que. takes advantage of the iPhone and iPod Touch — and pretty soon BlackBerrys and Android phones as well. 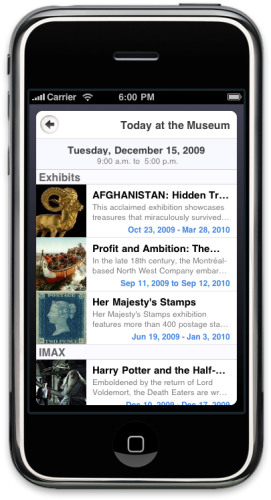 Just a week before Christmas, the CMC became the first museum in Canada, and among a handful in the world, to provide patrons access to audio and image enhanced information and tours via the iPhone and iPod Touch. 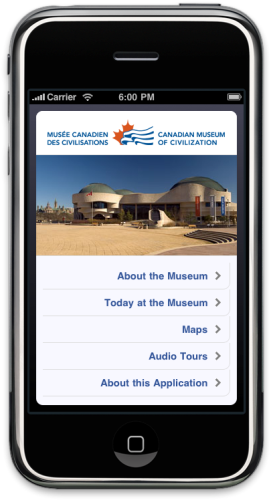 The CMC Mobile Application, which the museum developed with Tristan Interactive, an Ottawa-based mobile app firm, can be downloaded for free from the iTunes App Store. “We wanted to reach out to our growing Gen Y audience, and what better way to do that than embrace the technology they use,” said Julie Marion, marketing and branding manager for the museum, which first opened its doors in 1931. Located on the shores of the Ottawa River in Gatineau, CMC’s mandate is to preserve and promote Canada’s heritage for present and future generations. The museum attracts more than 1.3 million visitors each year. Marion said a growing number of visitors are younger people. People from around the world also visit the CMC’s Web site. To offer visitors a better experience, CMC allows them to access audio tours (previously available only through rented devices) for free on their own iPhones or iPod Touch devices. CMC’s mobile application also gives users real-time updates on museum exhibits and scheduled events, hours of operation, and access to an online map of the building. Currently there are two 40-minute audio guides available on the app, the Canada Hall and the First Peoples but the museum plans to expand the selection soon. It’s much like having a museum in your pocket, enabling you to plan visits well before reaching the building, said Victor Rabinovitch, president and CEO of CMC. Canadian organizations that fail to use interactive technologies, such as mobile apps and social networking, are blowing away a tremendous opportunity, said Steve Mast, vice-president and managing director of Delvinia Interactive Corp.
CMC began brainstorming the idea of a mobile app last summer when it sought to boost its multimedia strategy. The museum already has a YouTube channel and a Facebook presence. Marion said a podcast was one of the ideas initially considered but CMC later decided to go with the more current mobile app trend. 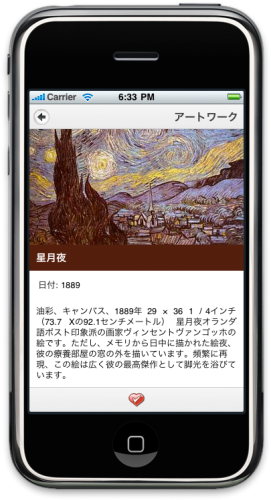 The museum’s in-house staff provided most of the data and content while Tristan Interactive, a firm that develops tourism-oriented mobile applications for governments and museums, created the mobile app. The company’s proprietary software product Autour, enables organizations to manage and deploy multimedia content on more than 40 types of mobile devices, according to Tristan CEO Chris McLaren. “Shortly CMC will be able to offer the application to BlackBerry and Android phone users,” he said. McLaren is a 15-year mobile app market veteran whose earlier credits include developing the mobile app for the New York Time’s famous crossword puzzle. He is optimistic about the future of smartphone app-based tour guides. “This technology is the face of the future. Many museums will see convenience and flexibility of the system and switch over,” he said. Users can also use the application’s barcode reading capability to retrieve information about an object, using their phone camera just as grocers use barcode readers. When visitors use traditional audio tour tools rented out in most museums, they leave the device behind after their visit. “But a mobile app stays on the user’s device,” he noted. CMC could use the app to notify users about future events and campaigns. In future they may even allow users to purchase tickets to visit the museum. Marion believes the app could serve as a valuable tool for determining client demographics and measuring visitor preference. Since its release on December 17, the app has been downloaded around 650 times. About 25 per cent of these downloads were from people living outside of Canada, while 75 per cent were from domestic users, said Marion. Autour also has a voting feature which enables users to identify museum pieces or exhibits that they favour. “Perhaps in future we can use this feature to guide the decision-making process when planning future programs,” said Marion. McLaren said Tristan continues to work on improving its product. For instance, he said, many people think of GPS and WiFi technology when the company mentions interactive map capabilities. For location finding, he said, Tristan is considering Bluetooth or RFID technology instead. The company is also looking at voice recognition technology.